I saw a few people review this title but I didn't read their reviews. (I have linked to them below.) I knew I wanted to read this one for myself before collecting the thoughts of others. 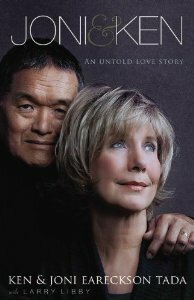 Before anyone else wrote anything about it, I ordered a copy of Joni & Ken: An Untold Love Story from Amazon. Just like so many of you, I read Joni's story of how she came to be paralyzed from the neck down and how God grew her in the faith through this perceived tragedy. I read her first book, Joni , as well as her second, A Step Further . Several years ago I read The God I Love (linked to my thoughts) which is her memoir. I noted in my reflections on the book that I had wanted to learn more about her relationship with her husband, Ken. Wish granted with this new title, Joni & Ken . Sometimes we make wishes and when they are granted we realize that we're a bit unwise in asking for certain things. Turns out I really didn't want to know about their marriage like I thought I did. Not that it was a bad book, because it was not. Although I did believe it was lacking in some areas (in terms of writing style) it was very revealing of who Ken and Joni really are as a married couple. I guess I can only say that I was a bit surprised to learn about how they really interact with one another, although I shouldn't be. The purpose of this book is to encourage couples who are struggling in their marriage to realize that God can take any broken relationship and heal it. Great, right? I think my entire problem with this book is that I was expecting them to tell us the story of how supportive they are and have always been towards one another and how their unique circumstance and lives makes them a shining example of What Christian Couples Should Aspire To in marriage. Instead I found a story of struggle, hardship and weariness. You could also throw in some doubt and confusion. And while there is triumph in the end, they've walked a long, hard road with one another. I'm not paralyzed and neither is Jonathan. And some days we're snippy with one another. Sometimes I can't snap out of a bad mood as fast as everyone would really like me to. Sometimes the children are really loud and demanding and interrupt our conversations with one another. Our house gets really messy to the point where I am unable to think. When Jonathan's alarm goes off in the morning, it wakes me up also. (I hate that.) I change plans on Jonathan all the time without warning. (He hates that.) We annoy each other even though we love one another. Turns out Joni and Ken follow much the same pattern of annoyance and love and devotion and irritation. They are just as committed to one another as Jonathan and I are, but they struggle to stay connected to each other when life becomes really busy (and their lives are rather busy). The book basically says this: marriage is work. Submit it to the Lord. He is faithful to help keep you two together and healthy, despite yourselves. Honestly, this book is not going on my "favorites" list. Although I was desperately curious to read it, I quickly became bored with it and I think that's more because of how the story was laid out than anything else. Their story begins in early 1980 and continues to the present. All throughout the book their fellow writer (Larry Libby) would hop back and forth between the present and the past weaving their story together for us. Although his manner was not confusing, per se, it did feel rather disjointed. The message which I have stated I believe this book to be trying to communicate is not remarkably easy for the reader to pick out. The thoughts are very jumbled and although this book ends on a note of encouragement, the reader is frequently left in a state of confusion as to where the book is headed. Sometimes random facts about either of the key parties are thrown in and I'm not sure why certain details about their persons and their families were thrown in. It's just not a smooth storytelling experience and that left me feeling a bit "meh" about the book on the whole. I do think the Tadas have an incredible story to share and I'm not at all sorry for them having taken the time to share it. I believe that their story has the potential to be encouraging to struggling couples in very valuable ways. For me personally it just felt like I was hearing about a couple very much like Jonathan and myself - always moving forward with every good intention to be obedient to the Lord and honoring to one another - but sometimes failing in the attempt. And yet I still believe that despite our failures, God is working a good thing in us and there is more, still, to learn. Not a remarkable book, but not too terribly disappointing all the same. Curiosity satisfied, I guess? Mark at Carstairs Considers . . . I think "hearing about a couple very much like Jonathan and myself - always moving forward with every good intention to be obedient to the Lord and honoring to one another - but sometimes failing in the attempt. And yet I still believe that despite our failures, God is working a good thing in us and there is more, still, to learn" was exactly what they were going for. Joni was concerned early on that Ken, as well as the general public, idealized her, so she tries to keep it real by honestly sharing her faults and failures in her books. I don't think they wanted to come across as super-saints with the message, "Be inspired by how great our marriage is" (that would have turned me off as unreal), but rather as "the Lord helped us in our difficulties and He can help you too," which I can identify with much more. And I liked, too, that they came through the difficulties with a renewed, though still not perfect, love for each other. I read a book about Joni when I was a kid, she was very honest with how she felt. It was well written though. I am always so relieved when I hear of people who are not perfect and are still married! People give up so easily on marriage these days. It's refreshing to hear of those who are lovingly yet grimly fighting on! I'm about to crack this book open right now and am very curious after reading yours and Barb's reviews. It's funny how the writing style and structure got in your way. For me, it seemed to flow perfectly. And I certainly liked how honest they were about things. In fact, I think the way they humbly revealed their flaws made me respect them that much more. Thoughtful review as always. And thanks for linking to me. Hmmm. . .do I want to re it now or don't I? Hmmm. . .
i'd love to read it -- you wanna sell? When I was a kid, Joni was presented as a modern day saint. :) I read two of her books back then and was impressed and discouraged at the same time because I could not live up to her "perfect" way of dealing with difficulty. But I'm still interested in reading this book! I'll wait and pick it up from the library when it becomes available.